Every time I finish a blogpost I wonder when I will run out of ideas or begin to repeat myself. But then usually something happens in my life and the next story is born. Paper doesn't blush nor does the digital word, readers have been merciful and six years went by in no time. "There should be a progression with anything one has been doing for a long time," my partner reminded me the other day. 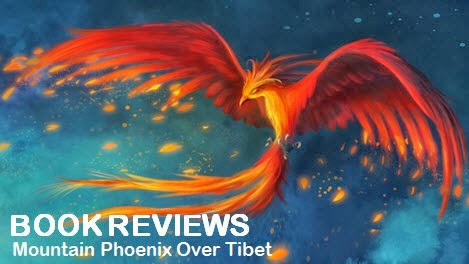 “Starting with the seventh year itch, Mountain Phoenix Over Tibet will come up with book reviews every now and then," I decided after some reflection. It is an opportunistic proposition. Since I occasionally read a book anyway, the calculation is to get more out of my readings when I know I have to come up with a halfway decent review afterwards. Like most people I have to take care of a couple of other things as well and so it’s only possible by trying to merge tasks and pinch off ten minutes here and there. The quality may suffer with this time-pressed approach but for the moment there is no alternative. Maybe it also complements my personality. If I can’t say it in simple terms and within a short time, I lose interest. “Doing research” bores me. Whatever it is I want to express must come straight from the heart. Many people write reviews faster and better. My value proposition is that the book reviews on Mountain Phoenix Over Tibet will bear reference to issues faced by someone who tries to do the splits, between daily life in the West and maintaining an organic link to all things Tibetan; searching for practical ways to embrace my roots while striving to learn the most from my environment. A lot of things happen in the process, some of which are perhaps worthwhile sharing with others. As with my blogposts my book reviews are therefore prone to focus on finding good answers that allow me to carry on in a pragmatic and ethical spirit – with the pious hope at the back of my head that readers in a similar situation may draw some benefit for themselves. The idea to do book reviews as a sign of progression was graciously accepted and so it looks like I have my first new year's resolution for 2014: Write a couple of reviews. Wishing everyone a good start into the New Year!